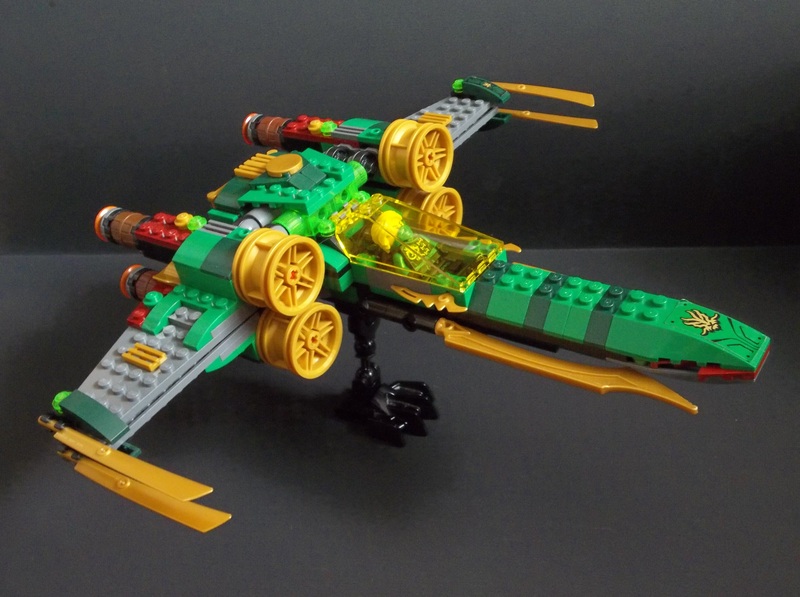 Fellow LEGO blogger Vaderfan2187 has been recently posting pics of Star Wars hardware recoloured for the Ninjago ninja (the three posts covering the six main ninja can be seen here, here and here). Excited about this awesomely original crossover concept, I decided to crash the party by building my own. Kai’s my favourite of the Ninja, and I was mostly expecting to build a vehicle for him, but then that stickered green curve element caught my eye. So pretty-boy Lloyd is the one who gets the X-Wing, despite him being my least favourite. Where Vaderfan2187’s creations were mostly simple recolours hewing much more closely to their far-far-away galactic originals, I’ve taken a slightly different route and more thoroughly Ninjified (Ninjagified? Ninjated?) the Original Trilogy X-Wing I selected as the base vehicle. 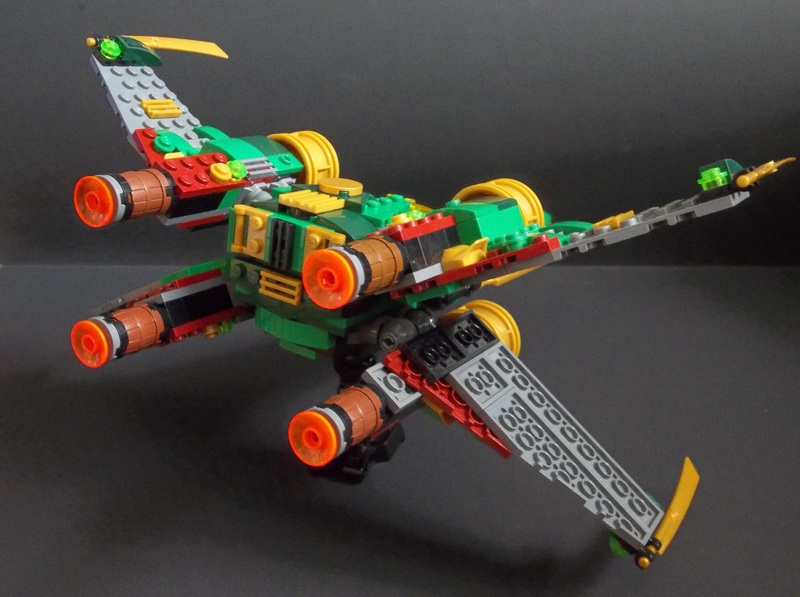 This is a full-on custom build, obviously, rather than a rebuild or modification of a set. 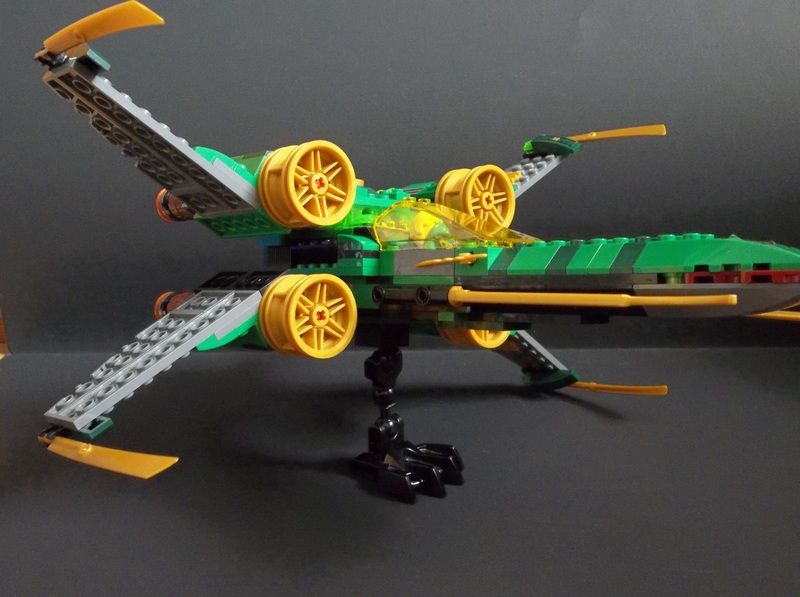 The height of the rear section relative to the cockpit is slightly off compared to the movie X-Wing, but it was the only way I could get those gold Ninjago-set Technic wheel hubs to work as the engine intakes. For extra Ninja coolness, I replaced the X-Wing’s wingtip cannons with gold blade elements, and added the hooked Bionicle sword blades alongside the forward section. All too many of my interesting black elements are still in use on the Blacktron Thunderbolt, which remains standing after nearly two weeks, which is closing in on a record where my MOCmaking is concerned. Be that as it may, it meant I had to use some dark grey as well as black for a base structural colour palette, and eke out the scheme with a little dark red, recalling the saddle on the Green NRG Dragon. The yellow cockpit was the only realistic choice, and I think it works well. I think trans yellow would work with Kai or Jay too, though probably not Cole, Zane or Nya. It seemed especially appropriate to use one of the Green NRG Dragon’s massive feet as a stand. It’s a little delicate, but I’ll put up with delicate for a stand so in keeping with the nature of the model. 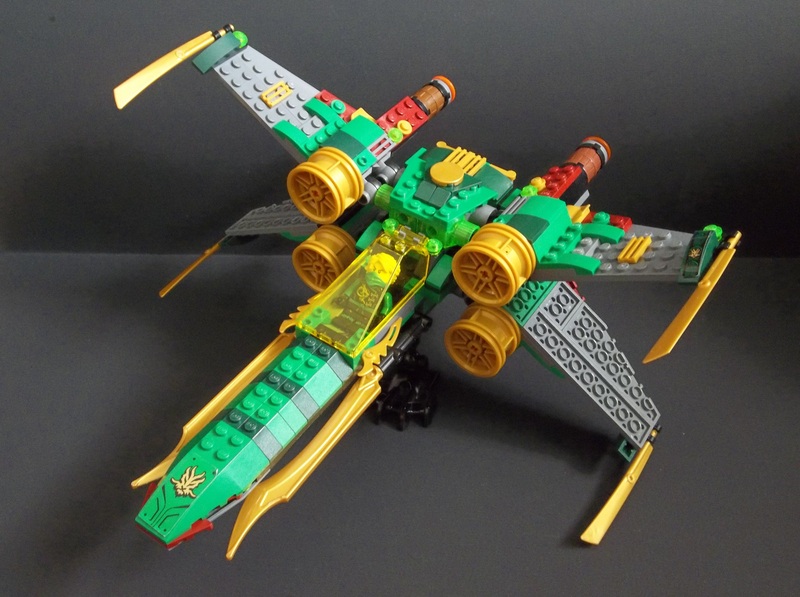 Anyway, here’s Lloyd’s Green Ninja X-Wing. I’m not sure how (or if) it fires, given that I removed the turbolasers and put blades in their place. Maybe it meshes with Lloyd’s green ninja energy somehow and can shoot out bolts of power from the hull itself the way Lloyd himself can from his body. 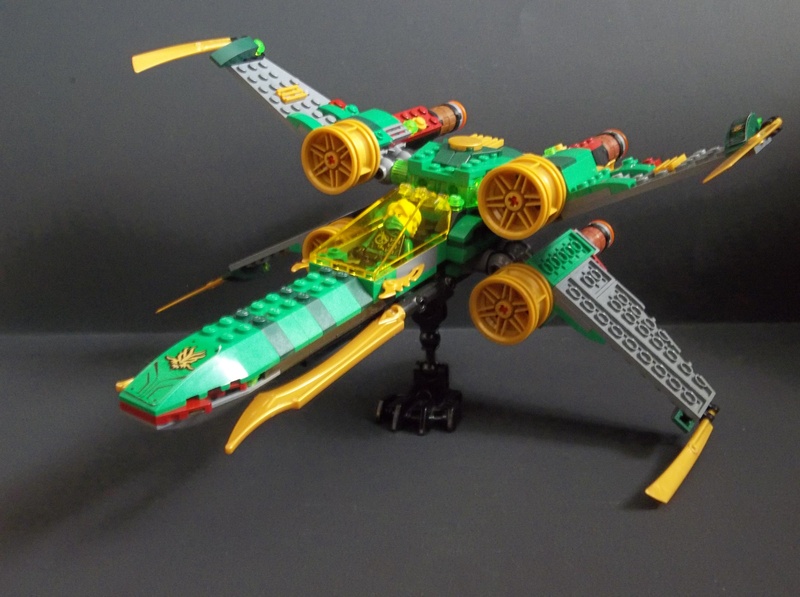 This entry was posted in Lego Space, LEGO Star Wars and tagged Genre fusion, Green Ninja, Lego, LEGO Ninjago, MOC, Star Wars, X-Wing on September 20, 2017 by geoffhorswood.